Richard Stephen "Bubba" Crosby (born August 11, 1976) is a former Major League Baseball outfielder who played with the Los Angeles Dodgers and the New York Yankees. He is best known for his tenure as a backup outfielder for the Yankees, when his defense and running games were often put to use and he played a prominent starting role near the end of the 2005 season. Crosby was a star at baseball powerhouse Bellaire High School (Bellaire, Texas) 1991-95, where he won a Texas 5-A sports state high school championship. At Rice University from 1996 to 1998, he earned All-American honors in 1997 and 1998. In 1998, he hit 25 home runs and drove in 91 runs in only 221 at bats, and batted .394 with a .504 on-base percentage and a .828 slugging percentage. He also had a 30-game hitting streak. He is the all-time Rice leader with 20 career triples, and 2nd with 59 home runs, 243 RBIs, 499 total bases, and a .737 slugging percentage, trailing only Lance Berkman in each category. William Marsh Rice University, commonly known as Rice University, is a private research university located on a 300-acre campus in Houston, Texas, United States. The university is situated near the Houston Museum District and is adjacent to the Texas Medical Center. In baseball, a run is scored when a player advances around first, second and third base and returns safely to home plate, touching the bases in that order, before three outs are recorded and all obligations to reach base safely on batted balls are met or assured. 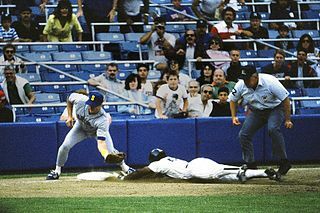 A player may score by hitting a home run or by any combination of plays that puts him safely "on base" as a runner and subsequently brings him home. The object of the game is for a team to score more runs than its opponent. Crosby was drafted by the Los Angeles Dodgers of the National League in the 1st round (23rd overall) of the 1998 Major League Baseball Draft for amateur entries. His best seasons in the minors in the Dodgers system were 1999 (.296 with 19 stolen bases in A+ ball), 2000 (27 stolen bases in A+ ball), 2001 (.302 with 22 stolen bases in Double-A), and 2003 (.361 in Triple-A). Crosby was finally called up by the Dodgers in 2003, while he was batting .361 with a .410 on-base percentage and .635 slugging percentage (1.045 OPS) in AAA. Nevertheless, he still struggled to find significant time in the majors as the Dodgers favored Rickey Henderson in a reserve role over him. Following a dozen at bats in Los Angeles, he was traded to the New York Yankees on July 31, 2003, along with Scott Proctor for Robin Ventura. Crosby played primarily as a starting outfielder (mostly in RF—where he has never made an error in the Major Leagues—and CF) for the Yankees. In 2004, after having made the team due to a strong spring training performance in which he hit .385 with two home runs and eleven RBIs,  Crosby gained a large amount of media and fan attention when, in his first series against the Chicago White Sox, he hit two home runs with five RBI in first five at-bats and made a diving catch. Notably, the first home run came in his first at bat as a Yankee and the second secured Mike Mussina's 200th career win. Nevertheless, upon the return of outfielder Kenny Lofton from the disabled list, Crosby was sent down to minors from where he would be called up several times. He ultimately received only 53 at-bats on the season, hitting .151 overall. He made both the ALDS and ALCS rosters as a reserve outfielder and pinch runner. In 2005, Crosby performed well in spring training again and made the team for the second year in a row but again found difficulty staying in the majors at the beginning of the season. He was optioned down to the Clippers on July 8, 2005, but returned to the Yankees on August 18. Crosby returned to the Yankees wearing jersey number 18 because his previous number, 19, had been assigned to the newly acquired Al Leiter. On October 10, 2005, Crosby, after having started several postseason games, was involved in a collision in Game 5 of the 2005 ALDS against the Los Angeles Angels of Anaheim. With the Yankees up 2–1, the Angels had runners on first and second with two outs when Adam Kennedy hit a pitch off Mike Mussina deep to right-center. Crosby and right-fielder Gary Sheffield collided while trying to catch the ball, allowing two runs to score to give the Angels a 3–2 lead. The Angels would go on to win the game 5–3 and continue to the ALCS. Crosby finished the season having hit .276 over 76 games. During the offseason, Yankees general manager Brian Cashman initially stated that Crosby would be the Yankees starting center fielder in 2006. Nevertheless, upon the large signing of Johnny Damon in December, he was again put in a reserve role and ceded his number 18 to Damon. Though again made the team's opening roster, he lost almost a month on the 15 Day Disabled list from mid-May to June. After having appeared in 65 games, on August 4, 2006, Crosby was designated for assignment by the Yankees. He cleared waivers on August 9, however, and reported back to the Clippers, remaining in the Yankee organization. He became a 6-year Minor League free agent after the season. Crosby hit .276 in 16 games in spring training with 1 homer and 7 RBI. Crosby was sent to the Triple-A affiliate Louisville Bats on March 24, 2007. "We just felt he was behind a couple of other guys for that spot," Krivsky said. Louisville placed Crosby on the disabled list after 13 games. The diagnosis was left shoulder tendinitis. Conservative treatment was unsuccessful, and on July 20, in Cincinnati, he had season-ending surgery on his shoulder. The Reds granted Crosby free agency in October 2007. On February 19, 2008, Crosby signed a minor league contract with the Seattle Mariners. On March 7, he was released for failing a physical. The reason for his failure was not disclosed. He has since retired from baseball. Donald Arthur Mattingly is an American former professional baseball first baseman, coach and current manager of the Miami Marlins. Nicknamed "The Hit Man" and "Donnie Baseball", he spent his entire 14-year career playing with the New York Yankees and later managed the Los Angeles Dodgers for five years. Carlos Iván Beltrán is a Puerto Rican former professional baseball outfielder. He played in Major League Baseball (MLB) from 1998 to 2017 for the Kansas City Royals, Houston Astros, New York Mets, San Francisco Giants, St. Louis Cardinals, New York Yankees, and Texas Rangers. A right-handed thrower and switch hitter, Beltrán stands 6 feet 1 inch (1.85 m) tall and weighs 215 pounds (98 kg). Ángel Maria Berroa Selmo is a Dominican former professional baseball infielder. Berroa was selected as the 2003 American League Rookie of the Year. He played in Major League Baseball (MLB) for the Kansas City Royals, Los Angeles Dodgers, New York Yankees and New York Mets. Juan Luis Rivera is a Venezuelan former professional baseball outfielder. He played in Major League Baseball (MLB) for the New York Yankees, Montreal Expos, Los Angeles Angels of Anaheim, Toronto Blue Jays and Los Angeles Dodgers. Mark Christian Bellhorn is an American former professional baseball infielder. In his ten-year Major League Baseball career, Bellhorn was best known for being the starting second baseman for the Boston Red Sox during their 2004 World Series championship season. Andruw Rudolf Jones is a Curaçaoan former baseball outfielder and designated hitter who played 17 seasons in Major League Baseball (MLB), most notably for the Atlanta Braves. Jones also played for the Los Angeles Dodgers, Texas Rangers, Chicago White Sox, and New York Yankees, and in Nippon Professional Baseball (NPB) for the Tohoku Rakuten Golden Eagles. Jones was a noted defensive specialist for most of his career and won the Rawlings Gold Glove Award for outfielders every year from 1998 through 2007. He had a strong throwing arm in addition to his elite fielding. He was an MLB All-Star five times, and he won both the Hank Aaron Award and a Silver Slugger Award for outfielders in 2005. Steven Allen Finley is an American former Major League Baseball outfielder. Raúl Ramón Mondesí Avelino is a Dominican former politician who was the mayor of San Cristóbal, Dominican Republic, and a former professional baseball right fielder. He played in Major League Baseball (MLB) for 13 seasons, primarily for the Los Angeles Dodgers, and made his MLB debut with them in 1993. He was the National League (NL) Rookie of the Year in 1994, an MLB All-Star, and a two-time Rawlings Gold Glove Award winner. Known for his combination of power and speed, Mondesí twice achieved the 30–30 club. Also noted for his strong throwing arm, he led right fielders in his league in assists three times while registering over 100 in his career. Joseph Franklin Vosmik was an Outfielder for the Cleveland Indians (1930–36), St. Louis Browns (1937), Boston Red Sox (1938–39), Brooklyn Dodgers (1940–41) and Washington Senators (1944). He helped the Dodgers win the 1941 National League Pennant. Luis Andrew Polonia Almonte is a former Major League Baseball outfielder and designated hitter. He currently resides in Santiago, in the Dominican Republic, his hometown. Joseph Franklin Demaree born in Winters, California, was an American baseball outfielder. He played all or part of twelve seasons in the majors for the Chicago Cubs, New York Giants (1939–41), Boston Braves (1941–42), St. Louis Cardinals (1943) and St. Louis Browns (1944). Randolph Edward "Randy" Moore was an American professional baseball outfielder. He played in Major League Baseball (MLB) for the Chicago White Sox, Boston Braves, Brooklyn Dodgers, and St. Louis Cardinals between 1927 and 1937. David Shelley Duncan is an American former professional baseball player. He was a left fielder, designated hitter, and first baseman. Duncan played in Major League Baseball (MLB) for the New York Yankees, Cleveland Indians, and Tampa Bay Rays. He is currently the Major League Field Coordinator for the Toronto Blue Jays. The 1976 Cincinnati Reds season was a season in American baseball. The Reds entered the season as the reigning world champs. The Reds dominated the league all season, and won their second consecutive National League West title with a record of 102–60, best record in MLB and finished 10 games ahead of the runner-up Los Angeles Dodgers. They went on to defeat the Philadelphia Phillies in the 1976 National League Championship Series in three straight games, and then win their second consecutive World Series title in four straight games over the New York Yankees. They were the third and most recent National League team to achieve this distinction, and the first since the 1921–22 New York Giants. The Reds drew 2,629,708 fans to their home games at Riverfront Stadium, an all-time franchise attendance record. The Reds went 49–32 at home and 53–28 on the road in 1976. The 76 Reds are considered by many as one of the greatest baseball teams ever to play. The Reds scored 857 runs in 1976, easily the most in the league that season. Their +224 run differential was also the best in the league in 1976. As of 2017, the Reds are the only team in baseball history to sweep through an entire postseason since the addition of divisions. The Reds went 7–0 in postseason play in 1976. Shane Michael Robinson is an American professional baseball outfielder in the Philadelphia Phillies organization. Robinson was drafted by the St. Louis Cardinals in the fifth round of the 2006 Major League Baseball Draft. He made his MLB debut in 2009. He played in Major League Baseball (MLB) for the Cardinals, Minnesota Twins, Los Angeles Angels, and New York Yankees. Daniel Richard Espinosa is a Mexican-American professional baseball infielder in the New York Mets organization. He has played in Major League Baseball (MLB) for the Washington Nationals, Los Angeles Angels, Seattle Mariners, and Tampa Bay Rays along with the Acereros de Monclova of the Mexican League. Drew Elliott Robinson is an American professional baseball infielder and outfielder for the St. Louis Cardinals of Major League Baseball (MLB). He previously played in MLB for the Texas Rangers. ↑ Rosecrans, C. Trent (2007-02-21). "Crosby likes Reds' camaraderie". The Cincinnati Post . E. W. Scripps Company. Archived from the original on 2007-09-30. ↑ "Reds outright Crosby to minors". WANE TV. 2007. Archived from the original on September 28, 2007. Retrieved 2 June 2014.